Zenith Bank Nigeria upgraded their service for the benefit and enjoyment of their customers, thereby following suit in serving their customers what I call free Wi-Fi browsing connection. This development was recently launched by zenith Bank officials in other to see to the satisfaction in their service being rendered to all banking with them. Well as you may know, this development is pointing to some expected needs of those banking with them. And this is to enable customers to have Internet access, to do various researches online, access online banking and mostly to download zenith Bank mobile app. For those of us in Lagos, some might already know that GTBank offers free WiFi at their branch in University of Lagos, Anoka. For customers to easily use there mobile phone and laptops to do anything online via the free WiFi in the vicinity, so we won't say Zenith Bank is the first nor would it be the last. READ ALSO: Latest on Diamond, Make An Instant Transfer To Other Banks Live On Diamond ATMs. Another Bank that offers free WiFi is Access Bank at their Alausa, Lagos branch. And I might also say that this service is being run in other states other than Lagos, so I won't say Zenith Bank is the first neither would it be the last. Zenith Bank also said that they have installed an advanced and wide-range free Wi-Fi hotspot serving the Lagos University Teaching Hospital (LUTH) and its vicinity, to give their customers within the hospital’s environment free Internet access via WiFi. How Can I Enjoy Zenith Bank Free WiFi Connection? For you to be able to enjoy this free WiFi service close to the vicinity, you would have to input your Zenith Bank Account Number as password. It just like way back in school, where you would have to input your Registration Number or Matric Number. How Do I Know The Branch With Free WiFi? 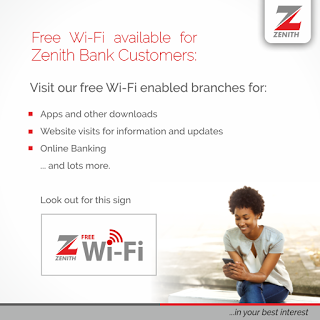 It very simple like ABC, all you have to do is Download List of Zenith Bank Branches With Free WiFi service. You can Download the file HERE in PDF format and go through it at your leisure time. Also let others know about this development by sharing the information with them. Got anything to say, or any contribution, suggestion, we would gladly welcome that as you can use the comment box below to express such.